Wedding Ring With Twin Finish : LOVE2HAVE in the UK! This titanium wedding ring is 7mm wide and comes in a dome profile. It features twin grooves which run parallel sitting towards the central area of the wedding ring. A beautiful understated and modern design for a wedding ring and at an affordable price too. The finishing comes in what is known as a twin style with this particular ring possessing a central polished stripe flanked by satin matt outers. We think the parallel grooves look particularly eye-catching against this unique finish. 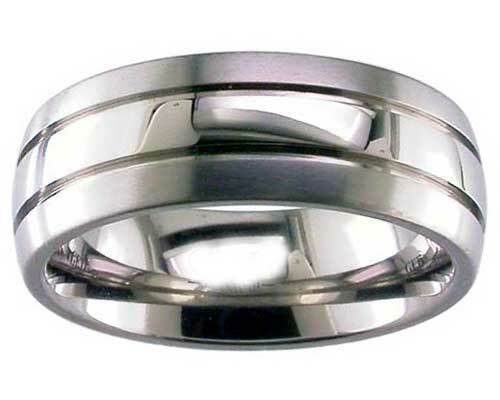 If you are looking for your wedding rings in a hurry, for whatever reason, you may be interested to know that this titanium ring can be made relatively quickly if need be just like the many other models in this section of our website.